The Edit screen is where you will spend most of your time, working on your pages. The image below will help you get acquainted with the basic elements of the Edit screen. When you open your project you will find that certain buttons will stay open at all times, and certain menus will appear depending on which screen you are working in. The "home" button in the upper left corner will take you back to your library shelf. Sections — This takes you to the Section Manager, where you can navigate to other parts of the book or create new freeform and portrait sections. Images — This takes you to the Image Manager, where you can import and manage images, approve contributed photos, add backgrounds or stickers, and access Skipple photos. Edit — Though not an active button, this area is highlighted when you are editing pages to remind you of where you are. People — This is where you will upload and manage your portraits. Details — This takes you to the screen where you can change the name of the book, page numbers, and the way portrait names are displayed. Team — This takes you into the Team Manager, where you can add and manage team members/collaborators. Information/Customer Care — This red question mark button allows you to easily access the Knowledge Base or contact Customer Care for support. Your Account Info — Click on your name or email to access a menu that includes your account information or change your password. Add to Cart — Click this to add the project you are currently working on to your shopping cart. If all sections are locked, it will take you to the checkout area. Underneath the Management Bar, you will find buttons that allow you to add text, shapes and lines, as well as Page Manager, Undo, Redo, and the Guides buttons. Spellcheck and a few other housekeeping items are accessible by clicking the advanced button. You can also zoom in on the page using the zoom slider. Down the left side of the screen, you will see the Design Tools. These tabs will allow you to edit your photos, browse and select predesigned layouts, view our extensive collection of stickers and backgrounds, add notes, and—if you are inside the hardcover or softcover templates—add text to the spine of your book. At the bottom left of the screen, you can toggle between the Photo Panel and the Pages Panel. 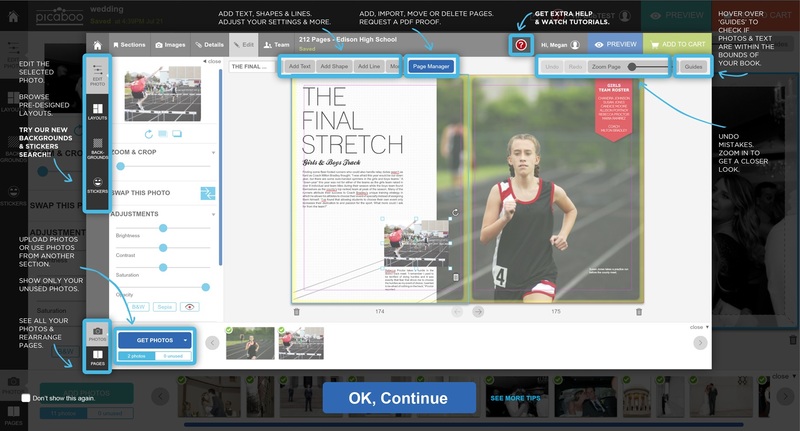 The Pages Panel will allow you to double­click on a thumbnail and jump to any page within the current section.